Jeep is legendary for their lineup of rugged and capable off-road vehicles. Their iconic models offer drivers incredible performance and versatility. No exception to this is the Grand Cherokee. 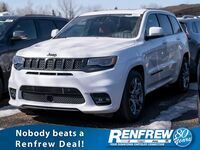 The 2018 Jeep Grand Cherokee offers Calgary drivers the perfect blend of comfort and performance. The exterior features the latest and greatest off-road equipment, stylish badges and available add-ons, while the interior is packed with a number of high-tech convenience features like the Uconnect® infotainment system with Apple CarPlay® and Android Auto® compatibility. Under the hood, drivers will appreciate the availability of the powerful HEMI™ V8 engine. 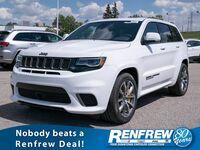 With multiple trim levels available, drivers will have the ability to build the perfect Jeep Grand Cherokee to best fit their driving needs and budget. Keep reading to see how the new Grand Cherokee stacks up against another popular off-road SUV: the 2018 Subaru Outback. 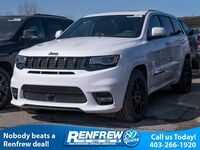 The 2018 Jeep Grand Cherokee offers drivers near Calgary, AB more power and capability than the 2018 Subaru Outback. The Grand Cherokee offers more torque (260 pound-feet vs 175 pound-feet), a higher gross vehicle weight rating (6,500 pounds vs 4,695 pounds) and a greater interior cargo volume (36.3 cubic feet vs 35.5 cubic feet). Jeep Grand Cherokee models come fitted with an eight-speed automatic transmission w/ OD and auto-manual, while Subaru Outback models come fitted with a six-speed Continuously-Variable Transmission w/ OD and auto-manual. Grand Cherokee models are configured as RWD or 4WD vehicles, while Outback models are only available with AWD configurations. 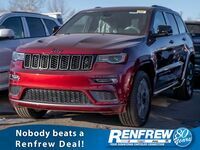 The Grand Cherokee base model (Laredo) offers a number of features you won't find in the base model of the Subaru Outback, including keyless entry, Dual-Zone Automatic Climate Control, heated front seats, a sunroof, a CD player and more. The 2018 Jeep Grand Cherokee is available in seven trim levels: Laredo, Limited, Trailhawk, Overland, Summit, SRT and Trackhawk. Each trim level features a unique set of standard and available features. 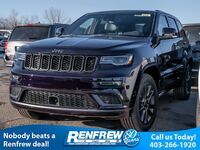 Schedule a test drive of the new 2018 Jeep Grand Cherokee at Renfrew Chrysler of Calgary, AB!